Bees are flying insects closely related to wasps and ants, and are known for their role in pollination and for producing honey and beeswax. 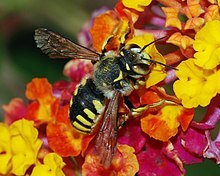 Bees are a monophyletic lineage within the superfamily Apoidea, presently classified by the unranked taxon name Anthophila. There are nearly 20,000 known species of bees in seven to nine recognized families. They are found on every continent except Antarctica, in every habitat on the planet that contains insect-pollinated flowering plants. The best-known bee species is the European honey bee, which, as its name suggests, produces honey, as do a few other types of bee. Human management of this species is known as beekeeping or apiculture. Men, like bees, want room. When the hive is overflowing, the bees will swarm, and will be likely to take up their abode where they find the best prospect for honey. In matters of this sort, men are very much like bees. Ingentes animos angusto in pectore versant. Their little bodies lodge a mighty soul. Virgil, Georgics (29 BC), Book IV, line 83 (translated by Joseph Addison). Pulveris exigui jactu compressa quiescunt. May with a pinch of dust be brought to silence. Virgil, Georgics (29 BC), Book IV, lines 86-87 (of bees swarming). Vita Sackville-West, in "Bee-Master" in The Land (1926). One can no more approach people without love than one can approach bees without care. Such is the quality of bees. Quotes reported in Hoyt's New Cyclopedia Of Practical Quotations (1922), p. 63-64. Anne C. Lynch Botta, The Lesson of the Bee. Emily Dickinson, Poems. V. (Ed. 1891). Emily Dickinson, Poems, XV. The Bee. Far-off heats through seas to seek. Ralph Waldo Emerson, The Humble-Bee. And steer his distant journey through the skies. John Gay, Rural Sports, Canto I, line 82. George Herbert, The Church. Providence. He seek him in your eyes. Robert Herrick, Mad Nan's Song. Is shining white with fragrant immortelles. Fly swiftly there and drain those honey wells." Helen Hunt Jackson, My Bees. At once with glowing fruit and flowers crowned. James Russell Lowell, The Sirens, line 94. As busie as a Bee. John Lyly, Euphues and his England, p. 252. The bee is enclosed, and shines preserved, in a tear of the sisters of Phaeton, so that it seems enshrined in its own nectar. It has obtained a worthy reward for its great toils; we may suppose that the bee itself would have desired such a death. Martial, Epigrams (c. 80-104 AD), Book IV, Epigram 32. (For same idea see Ant, Fly, Spider; also Pope, under Wonders). From pois'nous herbs extracts the healing dew? Alexander Pope, An Essay on Man (1733-34), Epistle I. 219. The act of order to a peopled kingdom. Which pillage they with merry march bring home. William Shakespeare, Henry V (c. 1599), Act I, scene 2, line 188. Seeking in vain one blossom where to fix. Robert Southey, Tkalaba, Book VI, Stanza 13. They dream their polity shall long survive. Charles Tennyson Turner, A Summer Night in the Bee Hive.